Dubai, UAE, November 14, 2018: As part of the month-long Dubai Fitness Challenge, Knowledge and Human Development Authority (KHDA) and Amity University played a friendly exhibition match at the Al Habtoor Polo Resort on 13th November. Dr. Abdulla Al Karam, Chairman of the Board of Directors and Director General of Knowledge and Human Development Authority (KHDA) led a team of colleagues from KHDA, against Dr. Vajahat Hussain, CEO of Amity Middle East and his team of students and faculty members. Each team of 4 was mounted on horseback using mallets with long, flexible handles to drive a wooden ball between two goal posts on a grass field at the equestrian-inspired resort. Following the match, Dr. Atul Chauhan, Chancellor of Amity University announced the launch of the region’s first Amity Polo Cup in association with the Al Jalila Foundation and the Amity Humanity Foundation. 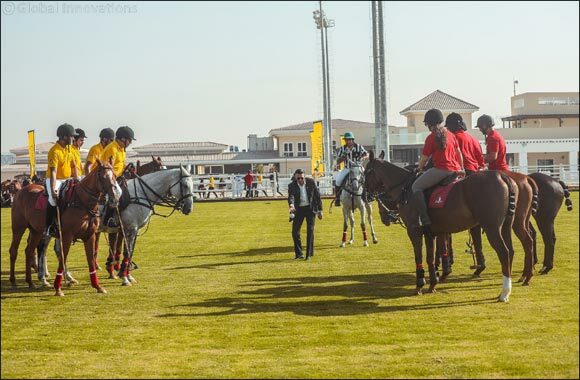 Scheduled to take place in 2019, the premium charity polo match will see UAE’s top male and female professional polo players coming together to raise funds and awareness for the education of the underprivileged. Al Jalila Foundation, a member of the Mohammed Bin Rashid Al Maktoum Global Initiatives is focused on transforming lives by providing scholarships to nurture and uplift a generation of professionals in the UAE. From pre-school to Ph.D. programmes, the Amity Education Group offer benchmark educational programs to over 150,000 students worldwide. The Amity Polo Cup is one of the Amity Education Group’s key non-profit initiatives for 2019 aimed at bringing together guests that support the sport and the humanitarian cause behind it. “Philanthropy is a big part of what we do at Amity Middle East. Our goal is to help create a society where opportunities to develop are increased and the access to education is made easier. It is an honour to be introducing the Amity Polo Cup in conjunction with Al Jalila Foundation, a charity organisation that is focused on making a true difference to the region.” said Dr. Atul Chauhan, Amity Education Group Chancellor.